On my way home, I stopped by a book store to pick up June's issue of Vogue Japan. I thought it would be fun to share some of the pictorials from the magazine. Head piece: Rochas. 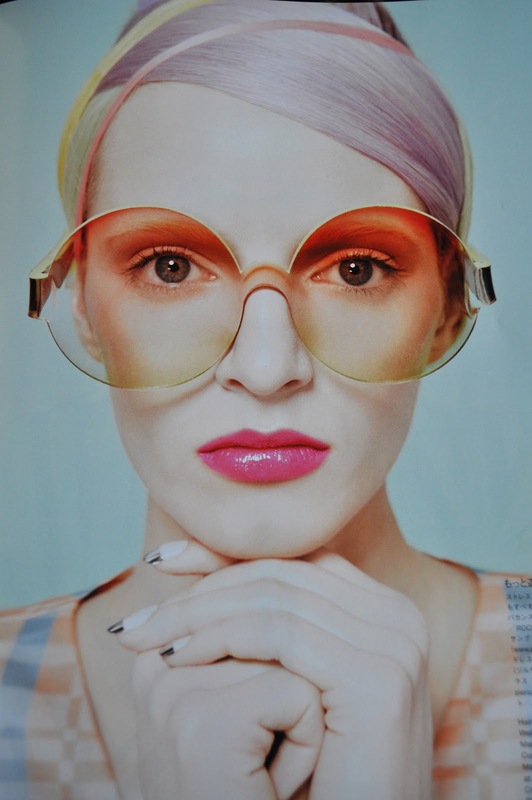 Sunglasses: Piers Atkinson. Top: Jil Sander. I adore the sunglasses in the photo above (don't be surprised if you see me wearing them in the near future :P) and I'm intrigued by the texture and colors of the head piece. Top & shorts: Balenciaga. Sunglasses: Hotel De Ville. Bangle: David Webb. Top: Marc Jacobs. Shorts & belt: Balmain. Sunglasses: Cutler and Gross. Bangles: David Webb. LOVE the two-toned Marc Jacobs print top, the shorts and the bangles, but I'm not a fan of the championship belt. Top & Skirt by Emilio Pucci. Shoes by Charlotte Olympia. I'm a big fan of prints and this print is just lovely. Also, I love how well those wedges work with the outfit. The next three photo are just brilliant pieces of art. I would definitely hang these pictures up in my apartment. Top & Skirt by DOLCE & GABBANA. I have an affinity for black and white photos. Top & dress by Oscar De La Renta. Don't you just love the colors in the photo above...I do! I love this photo on so many different levels. Ooh.. Those sunglasses on the first girl! I want! D: How come Japanese Vogue doesn't have Japanese models? Indian Vogue has Indian models..LOL! I'm on the hunt for those glasses! Good question, usually, there will be articles on Japanese artist, but not many Japanese models are featured...Odd! love these photos! adore these shorts and shirts!